Everyone’s favorite green dinosaur is back in Yoshi’s Crafted World, bringing all of its good vibes to the Nintendo Switch. Yoshi has had a mixed history as being the main protagonist. Although there were some games in the past – Yoshi’s Cookie and Yoshi’s Safari – the Yoshi game that inspired the look and feel of every Yoshi game after it is 1995’s Super Mario World 2: Yoshi’s Island. Its cutesy look – in this case, hand drawn – and the Yoshi controls you’ve come to know (and maybe love) stem from this game. Since then, Yoshi has struggled to bring out a quality experience, in my own opinion. Some would argue that Yoshi’s Woolly World was a step in the right direction. If that’s the case, Yoshi’s Crafted World is a good follow-up that has its faults but is, once again, a step in the right direction. I’m not quite sure what is up with Nintendo’s obsession with all-powerful gems powering inanimate objects (I’m looking at you Mario Tennis Aces) but here we are. In Yoshi’s Crafted World, a group of Yoshi are just having a good time on Yoshi’s Island hanging out next to the Sundream Stone which has the power to make dreams come true. Unfortunately, Kamek and Baby Bowser come in to steal the stone and manage to send it flying with all its gems scattering across the world. As such, it is Yoshi’s job to find all the gems before Kamek and Baby Bowser do. It’s like Dragon Ball Z but cuter. The story isn’t anything to rave about. It is simply a vehicle for traveling across the “hand-constructed” worlds which are brilliant. I mean this as a compliment, but it’s like a child created these worlds with stuff they found in a recycle bin. There are times where the materials used look real, as if someone took a picture of it. Every world felt unique and I was always excited to see where I was going next. Part of this excitement was due to the level design. Yoshi’s Crafted World plays like a 2D platformer but with some added depth both literally, since you can move into the foreground and background, and figuratively, thanks to the exploratory nature of the game’s design. I was always looking in every nook and cranny of every level trying to collect each flower and red coin in one run. I was always engaged, even on levels I didn’t particularly like. Those levels I didn’t particularly like were ones that forced Yoshi to climb aboard some sort of vehicle and get a high score by hitting as many targets as possible. The worst of these was one that made you control a plane by running up and down the top of a plane to control which direction it would go. Simultaneously, you’re trying to pop as many balloons as possible. I like that it diversifies the gameplay giving you a break from the same ol’ jumping up and down, but it felt terrible. The only thing worse than these dreadful moments is the music — it really is lackluster. 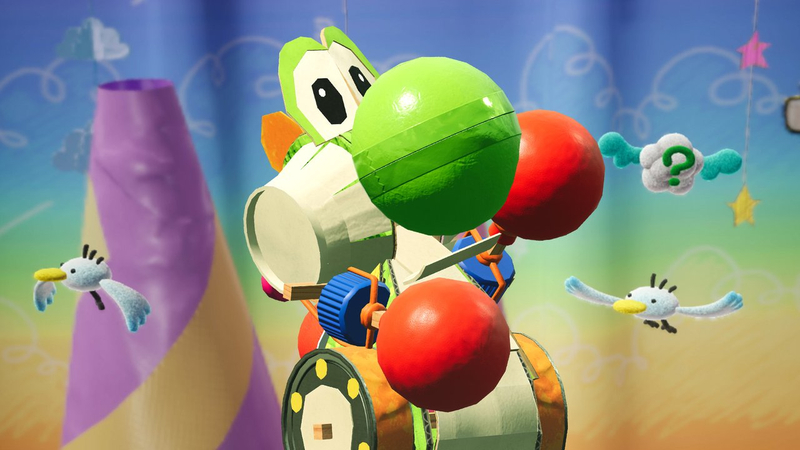 The music does fit the playful and cute aesthetic Yoshi’s Crafted World exudes but it has this dissonance that is very off-putting. It’s like my 9-year-old self grabbed a recorder and played the first thing that came to mind. Keep in mind, the recorder was never my musical strong suit. There also is only a handful of songs, none of which stand out. Music is important in creating the right atmosphere and while the music here absolutely does that, there could have been a better option. I also wish there was more of a commitment to the game’s paper crafted style. A great example of this “commitment” is Media Molecule’s Tearaway. Say what you will about Tearaway but its commitment to that paper crafted style and stop motion animation created this cohesiveness between art and animation that you don’t see in other games. 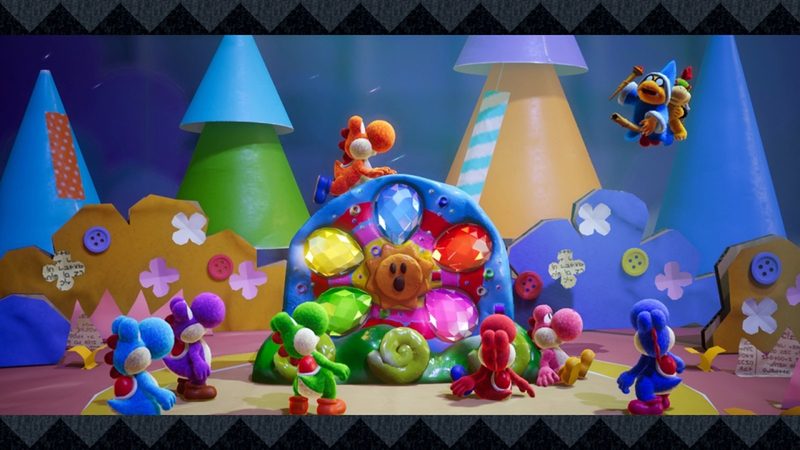 Yoshi’s Crafted World could have been this and there are some stand out moments, especially when Kamek is building each of the bosses. Still, I think Yoshi’s latest could have used more of this flair. Another route Yoshi’s Crafted World takes to deviate from the normal gameplay is with Poochy levels. After completing a normal level, a Poochy level unlocks which tasks you to find three Poochy Pups and complete the level in a specific amount of time. Although the gameplay is more fast-paced than the normal loop, the real differentiator is how it flips levels. Not only do you start from the end of the normal level, but your view is also set on the opposite side giving you an entirely new look. The ability to see all angles of a level is really neat; it adds a bit more to that notion that these levels are just pictures of handcrafted environments a child made. There are also a few bosses scattered throughout the adventure but they are few and far between. It’s unfortunate because these battles were genuinely fun. All of them, including the ending boss, are a bit on the easy side due to predictable patterns. The ending battle is a bit anticlimactic since it is so easy. Despite that though, it was still fun. This notion is true of the entire game. I had fun playing Yoshi’s Crafted World, but it is really easy. It wasn’t until I beat the game and started unlocking the bonus levels did Yoshi’s Crafted World have any sort of challenge. The fact that the costumes you earn also give you armor, it makes it that much easier to complete each level without a single scratch. But I would also say that is kind of the point, so it makes sense. Combining its playful (yet awful) music, cute art direction, and easy gameplay, Yoshi’s Crafted World is a relaxing experience that was quite refreshing. It was nice to just pick up the controller and feel like a winner. Sometimes you need that palette cleanser of a video game to come along and Yoshi’s Crafted World was just that for me.